It’s time to plan for back to school! While you might immediately think of buying new backpacks, markers, lunch bags and indoor runners, you should also be thinking how you can make your morning routine a little easier! Thankfully with the change of season and the start of a new school year, the fall is the perfect time to evaluate at your daily routines and, with the kids’ help of course, make some healthy changes! Before the first day of school, talk to your kids about what the morning routine will look like. Decide together when everyone needs to get up and get moving to get out the door without a mega melt down! Get all the kids involved in setting up the new schedule and deciding who will help with which tasks. Create a small poster together that highlights what everyone is expected to do in the morning. Review each year and add new responsibilities as the kids get older and can handle more tasks. Hang this poster near the front door so everyone can see it. Remind the kids to check the list instead of asking you what they need to do next! Get in the habit of making homemade snacks. It takes less than 2 hours every 3 weeks to make a batch of healthy cookies, healthy muffins and spinach brownies. Set an afternoon to bake with the kids, then store them in the freezer and on school mornings, the kids can pop them into their snack container with their lunch. Teach them the benefits of making homemade snacks and avoiding processed packaged snack foods while improving their baking skills and having fun in the kitchen! Set a routine for making lunches and get the kids involved. 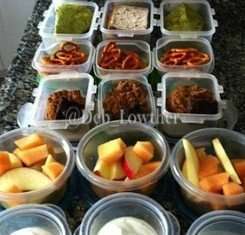 Have a container for everything and teach the kids what goes in each container. Give them healthy options and let them choose some items that are part of their school lunch. Letting them choose their healthy lunch will increase the likelihood that the good stuff gets eaten instead of stealthy ditched in the lunchroom garbage. Imagine sending your kids off to school each day with that kind of start! So as you begin preparing for back to school, don’t forget to establish a few new routines to give your kids the healthiest school year possible! Why do French kids eat everything?